The black movement in North Carolina has been an intricate part of a nationwide freedom movement. At the March on Washington in 1963, Martin Luther King, Jr. bottled this drive and commitment in his “I Have A Dream” speech. This speech embodies what blacks in North Carolina and, indeed, the South have been struggling to accomplish. The contents of that dream apply as much to the first black to step off a slave ship onto the shores of North Carolina as it does to the most accomplished black professional working in the state today. The black professional is connected to the slave by a torch that has been passed for generations and will not be dropped until blacks are recognized as full and equal partners on the human stage. Many of the physical barriers to achieving this end have been torn down in the last hundred years; however, lingering are invisible chains that have corralled the minds. Blacks in North Carolina should not be enchanted by the 1950’s and must be ever vigilant to preserve the accomplishments of the last several decades and encourage young blacks to seek the education that will enable them to reach their highest potential, for those without education will forever be subject to enslavement by those with this commodity. 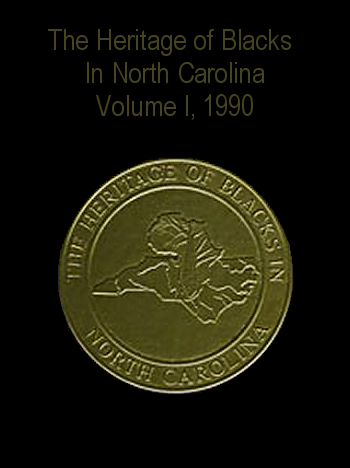 The Heritage of Blacks in North Carolina is the first known attempt by any group, organization or individual to collect the personal genealogical studies of a statewide group of Afro-Americans and present these materials in volume form. It is well known that the heritage of Afro-Americans, like that of their African cousins, has been passed down for countless years through an oral tradition. This is a very powerful and longstanding vehicle for passing on tradition and history among groups that have not adopted the printed medium. And even in the age of computers and videotapes, this practice remains a custom in many circles. While it is unlikely that any Afro-Americans have perfected the oral tradition to the degree that it is done in the Africa by professional griots, it is still a powerful medium to transfer history and culture from one generation to the next. Although time that a generation or so ago was generally reserved for storytelling and passing on tradition now must compete with America’s favorite pastime, the television, likely some vestiges of the oral tradition will be around for generations to come. Even so, whenever possible it is important to verify, supplement and enhance oral family history with primary documentation and artifacts. Obvious weaknesses attend relying strictly on an oral medium. One is that the family storyteller or historian can die unexpectedly without having trained and nourished an understudy on his / her rich diet of oral material. Another weakness is that the student can never know as much as the teacher about the periods of history prior to the student’s birth without having the opportunity to analyze supplementary materials. Finally, the oral tradition requires that all information be filtered through the personal lens of an often untutored storyteller prone to eliminating details the storyteller considered unappealing or likely not pertinent to the listener. Too, as stories are passed down from on person to another, or one generation to he next, inherently there is a tendency for details to be distorted and take on the colorations, characteristics and importance, or lack of importance, given the material by the storyteller. So family heritage passed down from one generation to the next through storytelling takes on a sharper and more meaningful focus when the oral tradition is corroborated by primary resources, pictures and artifacts. The publication of Roots coupled with its eventual television production fortunately served as an impetus for many Americans, especially Afro-Americans, to accent the oral tradition, which is so prominent, by anchoring family histories in primary documentation. The marriage of these rich family histories with genealogical research made available through private and public records offer a much clearer picture of the past. It is a credit to this country, and to North Carolina, in particular, that the families in this volume have agreed to share their stories through this medium. For in these pages are part of the American story that would not be known except for these families’ diligence, persistence and unselfishness. Each story and genealogical search is important, for each adds a piece to the giant human quilt representing aggregate humanity. Each story is singular in that it provides the author’s perspective on his / her family, yet the stories together form a collage of fragments which entail lie movement of a people along the course of life in North Carolina. These fragments are sewn together by sets of values held uppermost in the collective Afro-American community. Collectively, authors speak about the sustaining forces in their personal and family lives such as love, the thirst for education, faith in God, hard work and respect for the elders and their teachings, And as in life, there are stories entailing trials, tribulations and triumphs. There are disappointments, heartaches, heartbreaks and the assorted emotions that give birth to faith, courage and perseverance. There are dreams that come true and nightmares that linger too long before fading in the dawn. Homage is paid to parents, grandparents and extended family members who labored tirelessly in the fields and factories to provide the bare physical essentials, yet, were not too overburdened to direct offspring down the delicate track to spiritual enlightenment and offer formulas for sustaining life. It is hoped that this volume is but a beginning which will inspire future works of this nature. The culture of the Afro-American is unique and deserves microscopic exploration especially from an internal (family) perspective. Too often the dynamics of the Afro-American family have been viewed from the outside, resulting in misunderstandings and labelling of the institution as dysfunctional despite the overwhelming economic, social and political pressures and acts of discrimination. The driving forces and survival mechanisms which have sustained and inspired the Afro-American are evident in this volume of family stories. It is encouraging to see this effort by Afro-Americans in North Carolina which will further the field of genealogy. Only through such individual and collective pursuits can the true history of any group be told, and this should serve as an inspiration to other statewide and community groups for generations to come. This volume’s effort is to be applauded as one more patch in the quilt that represents the human race. ~ Alex Haley, April 18, 1990.